Hi there my name is Lori and Im from Pretoria. It was a pleasure to change the chanels one morning and find a fresh show thats light entertaining and interesting at the same time. I am a CNN o'holic but one sometimes needs that somethng different. And when you guys started explaining the usage of TWITTER ............. well Im yours forever. I have been battling like crazy. Top Billing is the ultimate though. A never miss programme. Good luck with your new studio and keep it up. 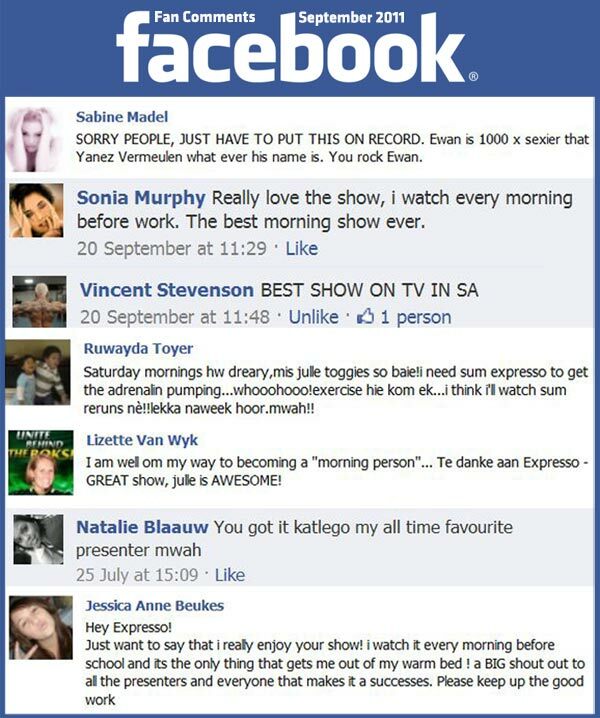 Awesome difference in you in this morning's Expresso Show !! (Mon 17th Jan 2011) EXCELLENT !! and thank you !! Also, great interaction between you and the presenters. You're a great bunch of people and a BLESSING to the viewers !! Keep up the great work !! Just a note to thank you so much for having Jimmie Earl Perry and Kaylim David in your studio last week. It was a wonderful experience for them and so very much appreciated. The concert last night was a huge success, completely sold out with people queuing for tickets. 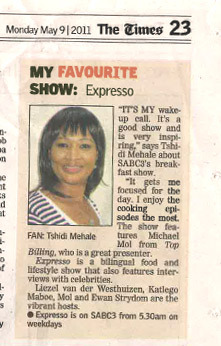 Many had seen them on Expresso so we are delighted to let you know. Kaylim is quite superb- unbelievable maturity, confidence and ability. Jimmy too was wonderful and has no doubt a fan club, was very obvious from the audience applause. Also to say how super it was being in your studios - full marks to everyone for their professionalism, in every way from reception downstairs to all the people on the floor assisting and stunning presenters who made Jimmy and Kaylim feel so welcome and special. Thanks to you too for making it happen. We have been in the UK for 3 months got back on the 1st Oct, what a surprise. I will try and make this short. My husband has always said maybe there should be a “ GOOD NEWS ONLY “ newspaper well I have found a “GOOD NEWS ONLY MORNING SHOW” to wake up to and make me feel good. WOW!!! Your show is absolutely “GREAT – GOOD – EXCELLENT – OUTSTANDING – FABULOUS “ there are just so many, many things GOOD about it. WELL DONE!!!! I have now viewed WILLOWSMITH’S video as well – what a star. Liz Ogumbo should be an inspiration to all South Africans!!!! Can’t wait for tomorrow’s show!!!!! !